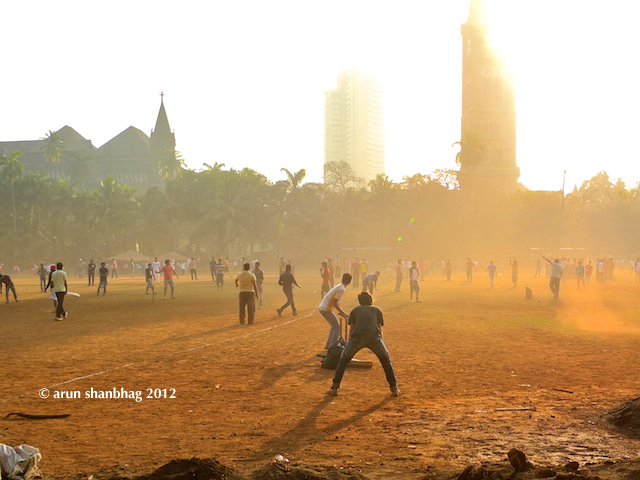 Its a long tradition in South Mumbai ~ come Sunday morning the boys head out to Oval Maidan with whatever gear they can scrounge around. They stake a tiny sliver of a pitch, drive stumps in the dusty field and play some cricket. The pitch (and cricket) is a social leveller; the quality of your gear is immaterial, its how you connect – bat to ball. Three stumps is a luxury and bells are definitely not needed. Who needs shoes and pads? A tennis or simple rubber ball will do. As kids I have even played with layers of paper crumbled hard and held by rubber bands. When you are all sweaty and exhausted, grab some limbu paani or ganna juice on the way back home. Another beautiful Sunday! Your iconic photographic record of Mumbai are a pleasure to see & read Arun, especially for those living elsewhere now, and have happy childhood memories of visiting these spots! Thanks Arun! Thank you Jo for that enthusiastic comment. Exactly, As I walked by the Oval that early sunday morning, it brought back fabulous memories of our “gang” heading out and staking out a pitch to play some cricket.